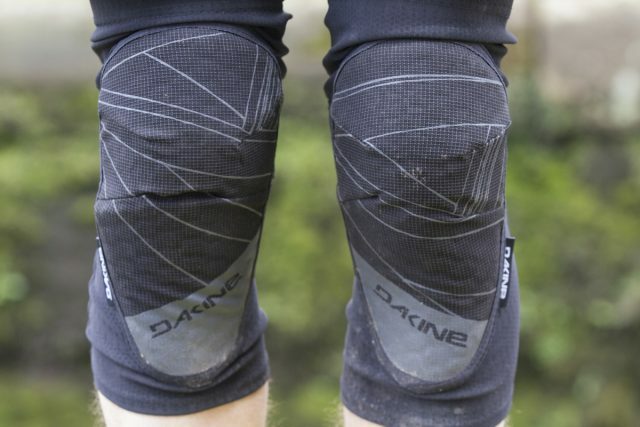 The Dakine Slayer is a soft-shell knee pad built with high tech protection. “The Slayer Knee Pads are the ultimate lightweight, highly-breathable biking knee pads for every level of rider, whether you’re set on a day-long pedal or heading out for all around riding. These pads feature a low-profile CE-certified foam impact pad for knee protection that moves with you. An ergonomic pre-curved design further enhances the custom-feel, while the silicon gripper elastic upper and lower cuffs ensure a slip free fit. We keep things cool and avoid hotspots with lightweight perforated 4-way stretch materials and an open back design. 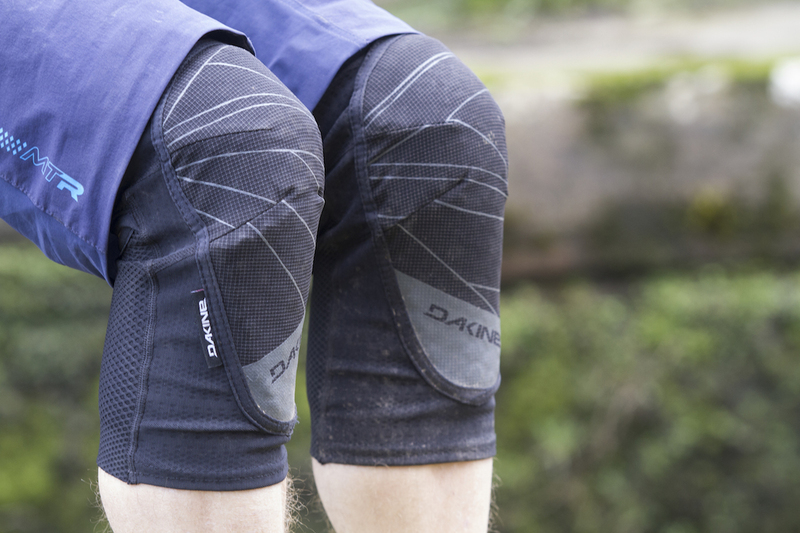 The Slayer Knee Pads are the only bike pad you’ll ever need no matter your riding style” – From Dakine. Out of our 14 test pads, the Slayers had the most coverage. The Slayer knee pads use a tight-fitting sleeve made from AriaprenePro fabric, with a cutout behind the knee for added flexibility and ventilation. While some pads stood out specifically for their breathability, protection or comfort, the Dakine Slayers were far more subtle, with a well-rounded performance that ticked pretty much every box there was. 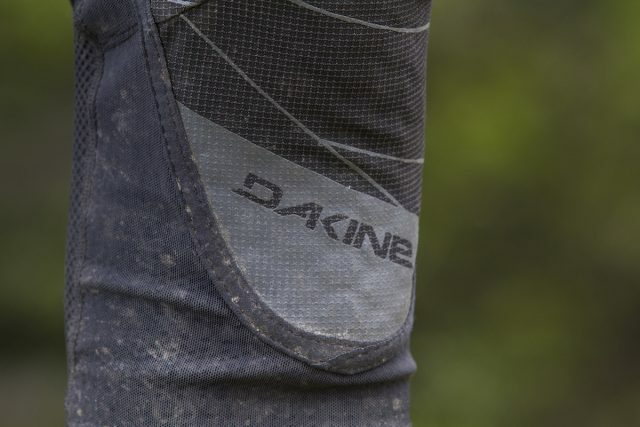 As a relatively new entrant into the body armour game, Dakine has jumped in with several high-quality soft shell knee and elbow pads. 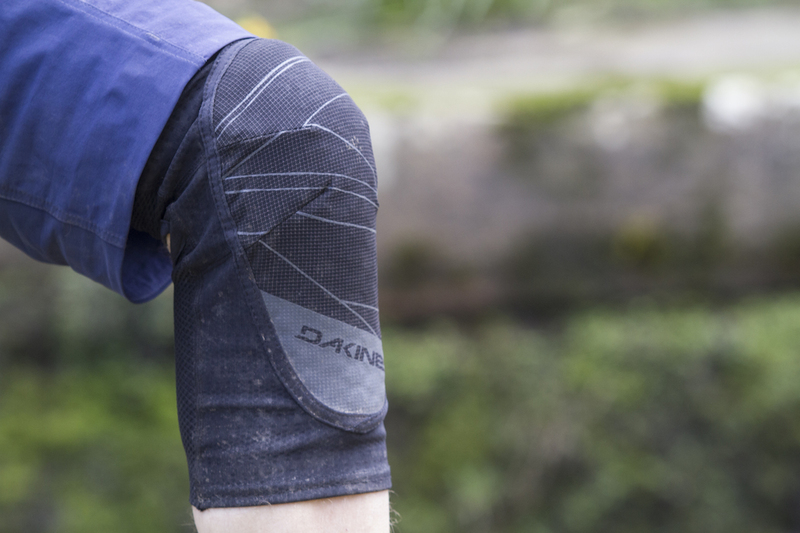 The Slayers are Dakine’s lightest weight knee pad, sitting alongside the heavier duty Anthem and Hellion pads. The protective foam pad extends a good way down your shins. Available in three sizes (Small, Medium, Large), the Slayers rock a tube-style construction with four-way stretch fabric providing a snug and adaptive fit. 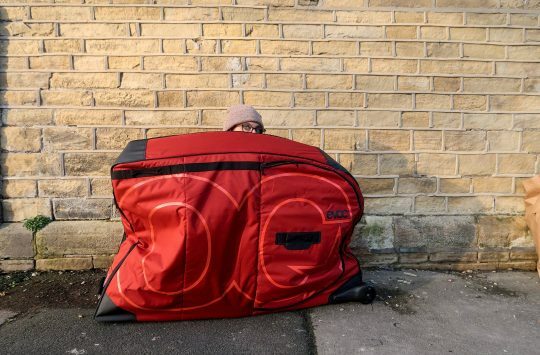 They’re not as lightweight as some of the more minimalist pads on test, but the thicker fabric offers the best durability and abrasion resistance of the lot. 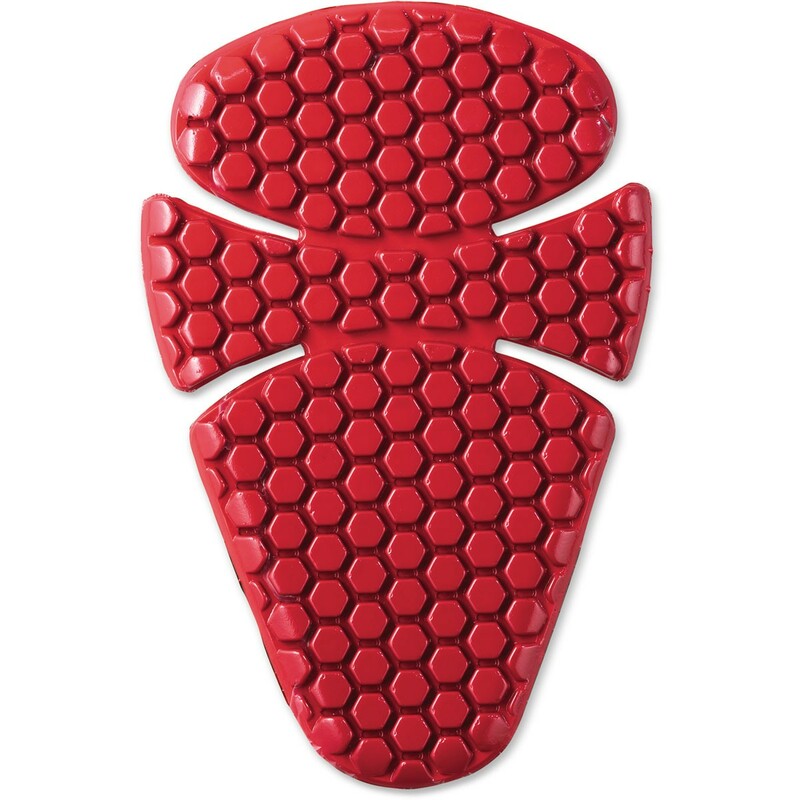 The foam pad itself is cut and profiled to articulate around your knee pad during pedalling. Instead of bigger and bulkier EVA foam, the Slayer pads employ Dakine’s own DK Impact foam. This is very similar to the VPD and D3O materials used on other brand’s pads, and it allows the Slayers to feel soft and flexible on your skin, while having the ability to firm up when an impact is met. The DK Impact pad is CE certified, and it offers a generous amount of coverage that extends a good way down the shin too. Mind you, the protection doesn’t quite wrap around as far on the side of the knee like the POC VPD Air does. 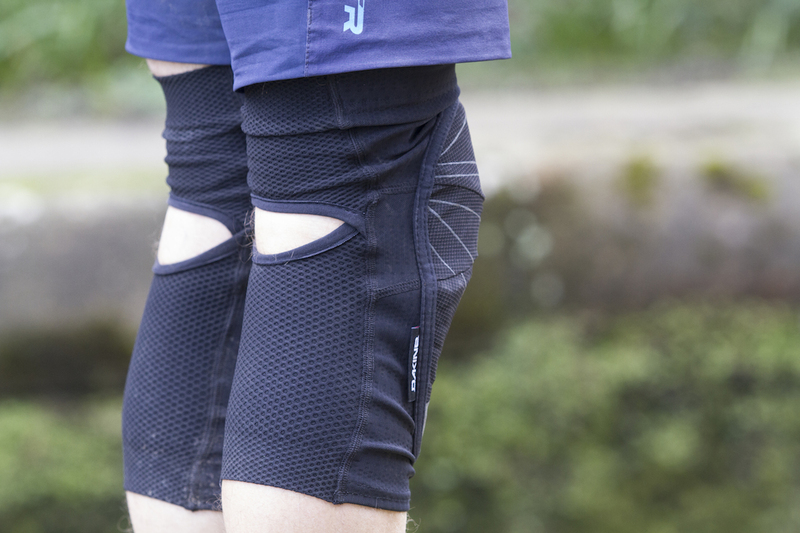 In use, the Slayer knee pads were comfortable and super stable with no hint of moving during a crash whatsoever. The pad is articulated to cup around your kneecap, and additional flex points are designed in to help the pads bend as you pedal. 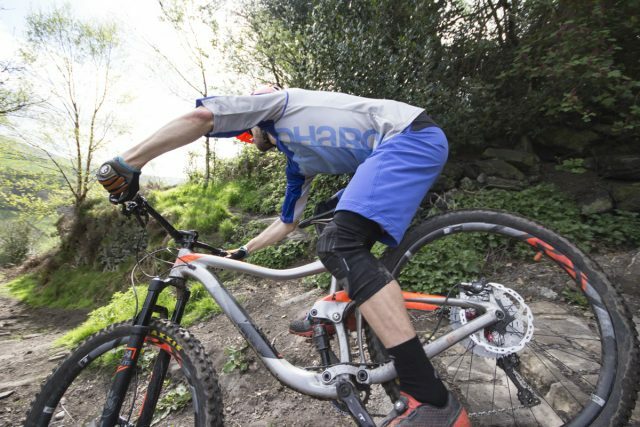 The overall fit is super secure, and testers never had any issues with the pad moving around either while riding or during an over-the-bars excursion. In fact, the Dakine Slayers were so snug that they were probably the hardest to pull off out of all the pads we tested, which I’m not really that fussed about. 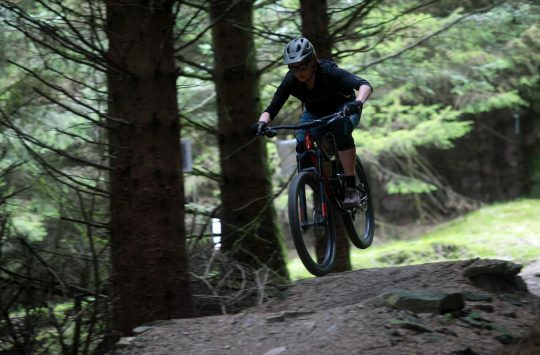 While a little beefier than some of the minimalist pads on test, the Dakine Slayers are idea for riders who want substantial protection in a flexible pad for pedalling. The Dakine Slayer pads are comfortable, highly secure, and the flexible padding is ideal for all-day pedalling. Factor in the coverage and high-quality construction and these are an excellent trail pad for those who value durability over lighter weight.